Among the most common questions brought to my attention by the golfers I work with are: "How come I can hit the ball so well on the range, but have a difficult time replicating this on the golf course?" and "Why can't I putt on the golf course as well as I do on the putting green?" When left on their own to look for explanations, many people focus on their thinking or their behavior on the course for the source of the answer. Actually, the answer typically lies more in their practice behavior than it does in their playing behavior and regularly includes a skewed perception of the results of practice shots. Sure it helps to hit lots of golf balls on the range. Sure it helps to roll lots of putts on the putting green. Sure it helps to hit lots of bunker shots, pitch shots and chips. In addition to hitting bucket after bucket of practice balls, what's even more effective and productive is to approximate as much as possible the actual experience of playing the game when practicing the game. Watching a typical golfer's practice involves seeing them hit ball after ball on the range, frequently using the same club and hitting to the same target over and over and over again. Watch on the putting green as many novices drop several balls and putt one, rake another and another and another - all to the same hole. That isn't real golf. Granted, early in the development and integration of a swing change, it's necessary to hit many shots simply to get the feel of the new swing. And if you're simply working on the mechanical "stroke" elements of putting, repetitive practice might be beneficial. However, once these changes have become more habitual, it's important that the practice protocols change as well. With a full swing, this involves changing clubs with a high level of frequency and changing targets on every shot. In addition, it's critical before hitting the ball that you have in mind a clear picture of the type of shot you want to hit and pick out a small, specific target. This more closely resembles what you're attempting to do on the course. Hitting five, 10 or 20 drivers in a row doesn't resemble or reflect what you do on the course. Why then would you practice in this manner? When you hit several of the same shots to the same target, there's a tendency to get forgetful about the result of each one of the shots. For example, if you hit driver 10 times in a row toward a flag on the range, you might have a tendency to remember the three or four that you bombed reasonably close to your intended target. Along with this, you might forget the three or four that were hit reasonably well, but were well off line - shots that would be in the rough or worse on the golf course. Of course, as a mental game consultant, I would want people to ultimately remember the shots they hit well and "forget" the ones that they didn't hit well. Let's be realistic when doing the comparative analysis between the range and the course. It's possible that what you think is stellar shot-making on the range is actually you employing selective memory about how well you really hit it on the range. Another possibility is that after you hit several drivers, the ninth or 10th one feels really good and those are the ones you're comparing your shots to on the course. Reality is that you don't get the luxury of hitting 10 drivers in a row on the course and you may actually go a long time - even an hour or more - between times that you use the same club twice. 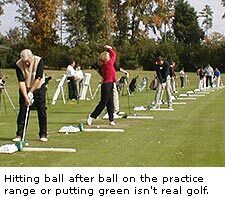 Thus on the range, the more you change shots and clubs and targets, the more it will feel like the "real thing" to you. Similarly, on the putting green, it's important that a large portion of your practice be devoted to putting with one ball, with a full read and pre-putt routine, to varying holes. If you miss, finish your putt. Again, this puts some "positive pressure" on you to make the putts and replicates to the degree possible what you might encounter on the course. Otherwise, hitting several putts from the same place helps determine the speed and break of the putt and gives some players a false sense of confidence or security that comes after determining this with several trials. No wonder it feels as though the putter works better in the practice area! Change some of your practice habits to more closely resemble the tasks that you ask yourself to accomplish on the course and you'll see your game in a more honest light and see the time you spend in the practice area pay greater dividends. Jeff Troesch is an internationally-recognized expert in the field of mental skills training and performance enhancement and has been involved in training athletes and other elite performers since 1988. He served as director of mental training for David Leadbetters' Golf Academies, where he was instrumental in assisting in the development of the training programs and methodology that continues to produce golf champions around the world. Troesch currently works with several touring professionals and amateur players, assisting them in the creation of optimal training plans and developmental strategies. He has been a consultant to several teams and organizations, including Major League Baseball's Seattle Mariners and Detroit Tigers; the National Basketball Association; the U.S. Soccer Federation; and many other professional, collegiate and amateur sport programs. He currently serves as the consultant to UCLA's women's golf program. Troesch's work has been featured in Golf Digest, Golf Week magazine, Asian Golf Magazine, Baseball America, Fox Sports' "Going Deep," Gillette Sports Week, Wide World of Sports, Tennis Magazine and several international publications. He is also a recognized speaker for many golf-related and other sports association events including the American Junior Golf Association. He can be reached here.